Whether you're a millennial or mid-career professional, investing in a tax-efficient manner needs to be a top priority. And that applies not just to socking away savings at home, but also in a workplace retirement plan, too. A case in point is new research by economics and business professors from Harvard and Yale. The group compiled participation data and surveyed investors across a swath of large U.S. corporate retirement plans. Each offers a traditional pre-tax 401(k) plan as well as a post-tax Roth option. Picking the right option, this study suggests, is crucial to investors trying to prepare for comfortable lifestyles in their golden years. For a typical 401(k) plan participant contributing $5,000 annually over 40 years, the report's lead author tells the Wall Street Journal that investing in a Roth account -- as opposed to a traditional one -- could result in $120,000 more in "spending power." Conservatively invested, that could equate to about $700 a month extra in retirement, according to the behavioral scientist, who used a hypothetical 5% annual return and 20% tax bracket to formulate such an estimate. "It's a tough call to choose between a Roth and a traditional savings account. After all, people don't really know where they'll be in 30 or 40 years," says Shareen Balkey, director of retirement services at Index Fund Advisors, which works with 60-plus corporate retirement plans. Eligible contributions may reduce taxable income. Withdrawals are taxed as ordinary income. Withdrawals prior to age 59.5 are subject to income tax and a 10% penalty. In certain situations, an employee can contribute outside of a workplace retirement plan to a traditional IRA. Depending on an employee's income, these contributions may or may not be deductible. For 2018, the contribution limit is $5,500, or $6,500 for those at least age 50 by Dec. 31, 2018. Accounts are subject to required minimum distributions (RMDs) after age 70.5 and contributions can't be made after this age. Individuals can use earned income, not investment income, to meet contribution limits. Source: Doug Parham, CPA at Boldt Carlisle Smith in Salem, Ore.
* This list is for general educational purposes only. Actual applications of IRS rules can vary greatly. Contact your tax professional for specific details about making retirement contributions. Here's the rub: In a traditional IRA, or Individual Retirement Account -- any money "contributed" grows each year unabated by taxes. That's typically true as well in a 401(k) or 403(b) plan at work. Using a Roth IRA or Roth 401(k) account, however, lets you contribute on an "after-tax" basis. That means you pay taxes now in return for an ability to withdraw any investment gains in a tax-free manner during retirement. "To most savers, deferring taxes until later intuitively seems most sensible," says Jamie Hopkins, co-director of the American College's New York Life Center for Retirement Income. "But there are a lot of very attractive benefits of using a Roth -- it's really worth taking a close look at whether you'd be in a better situation using one over the other." Withdrawals of contributions are generally tax and penalty free. Withdrawals of earnings are tax free if five years have passed since the tax year of your first contribution. A 10% penalty will apply to those withdrawals if made prior to age 59.5. Once you turn age 59.5, you can withdraw any amount without having to pay the 10% penalty. Providing five years have passed, these withdrawals would also not be subject to income tax. Not subject to required minimum distributions (RMDs) after age 70.5 and contributions can typically be made at any age. Don't generally increase a retiree's tax rate, Medicare premiums or taxation of social security benefits since distributions are generally not taxable. Besides deferring taxes, Hopkins says most wealth accumulators, if eligible, lean to traditional IRAs to take advantage of being able to reduce their yearly taxable income by the amount contributed. And that can be a major plus. A rule-of-thumb is that if you expect to pay less in taxes after retiring, then it's probably a better bet to use a traditional 401(k) or deductible IRA. That's due to a general perception that earnings levels will drop once you stop working full-time, hence so will your effective tax rate. The trade-off is that taxes usually must be paid in most cases upon any withdrawals from such a pool of savings in retirement. Of course, missing in any broad debate about tax efficiencies is a litany of contingent rules and regulations regarding appropriate uses of Roths and traditional IRAs. Each investment situation is different, making tax applications of such broad-based rules a highly individualized process. 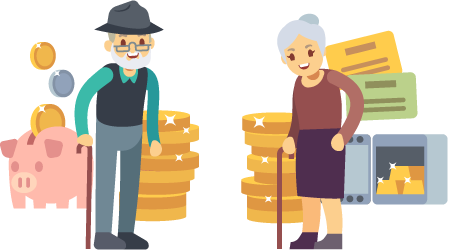 As a result, we encourage anyone with retirement planning questions to take advantage of an IFA advisor's objective set of eyes to ensure they're investing in an effective and tax-savvy manner.